With version 1.13, Second Life has introduced a ‘Web’ tab to the profile dialog. This tab can display a web-page of your choice. Be warned that it doesn’t use a fully-featured browser, and some pages will not display correctly. Also, if you start clicking links to other web pages you will soon notice the lack of a Back button. But these are minor issues. On the whole, the Web tab is a nifty addition, and opens up some fun possibilities. Snapzilla Mini: if you use Second Life, you are probably familiar with Snapzilla (if not, visit the site, and rectify this at once!). Christiano, the developer and maintainer of Snapzilla, has created a Snapzilla page designed for use in the Web Profile tab. Simply set the URL to http://www.slpics.com. To display your own snaps, set the URL to http://www.sluniverse.com/pics/Default.aspx?Name=Your+Name, replacing ‘Your+Name’ with your Snapzilla log-in name (with ‘+’ instead of any spaces). Links Page: if you have your own website, create a page of links, and point the URL at this page — you can then use the Web Profile to jump to other pages that you want to see. You can return to the links page by simply clicking the Home button again. The only thing to be careful about is that if you click the Ok button to close the profile dialog, the current webpage will become the Home page. Go Shopping: at the moment the Second Life shopping websites (such as SL Boutique and SL Exchange) aren’t really designed for being displayed in such a small area as the Web Profile, but with luck they will rectify this. It is still possible to use the sites, though, which means that you can now shop on these sites from with Second Life itself. SL Boutique definitely works (I bought something from it, just as a test), though I found that I couldn’t log in to SL Exchange — this might be just temporary problem with the website itself, of course. Yesterday (Nov 29) Linden Lab released the version 1.13 of Second Life. I logged on last night when the upgrade finally completed, several hours late, to find that my account was showing no money, my avatar was ‘Ruthed’ (see the bottom of the page), and when my avatar stood still, his legs were at a peculiar angle, and his feet sank into the ground. The SL website itself was completely inaccessible (please, please don’t tell me that the web-site is hosted on the same server network as the main SL Grid). It’s not as if this was unexpected — every recent upgrade has gone wrong, sometimes seriously wrong, and Linden Lab have had to spend the next few days fire-fighting all the issues. What’s going on? Can they really not manage to do an upgrade without breaking things? I’m a professional programmer (I’m not sure if that is a boast or an apology! ), and I recognise the symptoms. Let me make my own educated guess as to what is happening. Second Life as it now stands was never designed. Instead, it has gradually evolved over the years. New features have been grafted into the old code, no doubt accompanied by little hacks and work-arounds. Over time, these fixes to make the new code work with the old have become more and more complicated and hard to understand and analyse for problems. As a result, the system has been increasingly difficult to make changes to without breaking things. What needs to happen is for Linden Lab to stop developing new features, and instead to spend some months tidying and cleaning the existing code, refactoring and restructuring it to make it easier and safer to amend in future. Unfortunately, I’m not sure that Linden Lab has an ethos that allows that kind of thing to happen. Instead, we are likely to be faced with increasingly fragile upgrades. Ruthed? Every avatar in Second Life has a body shape, which you can alter using the ‘Change Appearance’ options. You can even buy new body shapes. Second Life comes with default body shapes, both male and female. The female one is known as Ruth. Occasionally something will go wrong, and your avatar will revert to the Ruth body shape. It’s colloquially known as being ‘Ruthed’. All I need to do now is to furnish it. I’m a little bit torn between creating my own furniture and taking the easy option of going and buying some. There is a lot of very good stuff around. Maybe I’ll try creating a few pieces, and if I’m not happy with the results, I’ll go out and buy instead. No, I am not about to launch into a Humphry Bogart impersonation. “As Time Goes By” is the title of an exhibition that has just opened at the “Prim and Proper Hall” in Caledon, and which I have just returned from visiting. Every now and then I stumble across something which restores my faith in the whole idea (or should that be ‘ideal’) of Second Life as a place for creativity and imagination, and this exhibition is one of those things. 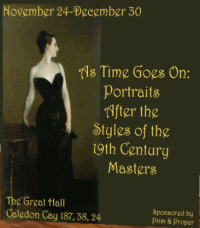 Created by Callipygian Christensen, and hosted by the gracious Duchess Shenlei Flasheart, the exhibition consists of some noted Victorian paintings, along with Second Life recreations of those paintings. A very neat idea, and very neatly executed. With luck this panoramic view of one part of the exhibition will convey the idea (Ms Christensen herself can be glimpsed in the bottom right corner, modestly hiding behind a fan). Do yourself a favour, and pay it a visit. As Time Goes By exhibition, at Prim and Proper Hall, Caledon Cay. On my travels around Second Life, one area that caught my eye as a good place to live was Caledon, a Victorian-themed sim run by the gentlemanly Desmond Shang. I got in contact with Desmond, and as luck would have it there were some places going in Caledon Moors — an area of Caledon with a slightly spooky atmosphere, just perfect for a gentleman-sorceror such as Pyter. I’ve rented a plot of land just beside a low range of hills (where there seems to be an archeological dig going on — I trust that they will not disturb That Which Should Be Left Alone), and I have plans for a Gothic mansion. Think ‘The Addams Family’.